In a medium mixing bowl stir together flour, baking powder, and salt. Make a well in the center. In another bowl beat egg yolks slightly. Stir in milk and oil. Add egg yolk mixture all at once to the dry mixture. Stir just till moistened (should be lumpy). In a small bowl beat egg whites until stiff peaks form (tips stand straight up). Gently fold egg whites into flour and egg yolk mixture, leaving a few fluffs of egg white, Do not overmix. 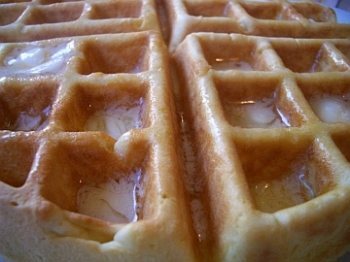 Spoon waffle batter into your waffle iron, making sure not to overfill it. Serve with real maple syrup and unsalted butter..